NASA's next-generation Mars rover, Curiosity, took its first baby steps on Earth today, making two slow drives forward and back on the floor of the clean room where it is being constructed at NASA's Jet Propulsion Laboratory. NASA'snext-generation Mars rover took its first baby steps on Earth Friday ? a fewshort drives that herald its upcoming mission to the red planet. "Thisis great, this is really exciting," said Ashwin Vasavada, deputy projectscientist for the Mars Science Laboratory rover's mission. "This is a hugemilestone?It's a rover." 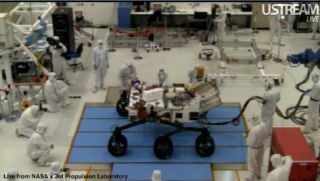 Theambitious new rover, named Curiosity, took center stage in the clean room ofNASA's Jet Propulsion Laboratory, showcasing a whole slew of new instruments and support features. It drove just about 3 feet (1meter) back and forth in its first drives. NASAbroadcast the rover's first drives live in an Internet webcast. Thisweek alone, spacecraft technicians and engineers attached the Curiosity rover'sneck and head (called the Remote Sensing Mast) to its body, and mounted twonavigation cameras (Navcams), two mast cameras (Mastcam) and the laser-totingchemistry camera (ChemCam). Curiositywas also sporting a new set of six aluminum wheels, each about 20 inches (about half a meter) in diameter, as it took itsfirst drive on Earth. The large rover now stands at about 7 feet (2 meters)tall. Therover will also be outfitted with a 6-foot (1.8-meter) robotic arm that carriesa large jackhammer drill and microscope. The rover will be able to drillapproximately 2 inches (5 cm) into rocks, and sample the composition of thepowder. Therover is scheduled to launch in 2011 and touch down on Mars soil in August 2012. MSL's primary mission is to study thehabitability of a landing site on Mars, and to conduct tests on Martian rocksin order to sample the planet's geological history. "We'vebeen following the water for a decade of so, and now we know there is water onMars," he said. "What MSL will do is take a next-generation set ofinstruments, and in detail, determine the habitability." And,everything appears to be progressing nicely. "It'salways wonderful to see a baby take its first steps," said Kevin Talley,who was a driver for the twin Mars Exploration Rovers Spirit and Opportunity. "Andthat's a big baby." TheSpirit and Opportunity rovers landed on Mars in January 2004 for whatscientists initially planned to be a 90-day mission, but both have faroutlasted their life expectancies.. Now, more than six years later, Opportunityis still going strong as it rolls toward a huge crater called Endeavour. Spirit,meanwhile, has transitioned into a stationary explorer on Mars, after gettinginescapably stuck in deep Martian sand last year. It is currently in ahibernation state due to low sunlight levels for its solar arrays, missionmanagers have said.